Independent booksellers are unheralded heroes of the literary world. While Amazon, Barnes & Noble and the like take most of the spotlight, it’s the indies who are the engine behind a book launch. 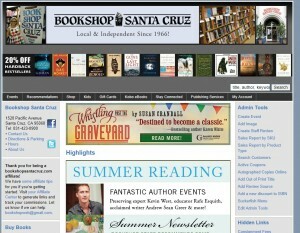 As such, I’d like to thank Bookshop Santa Cruz for featuring Whistling Past the Graveyard on the homepage of their website. I truly appreciate your support of the novel. If you are an independent bookseller with a window display or a store display for Whistling Past the Graveyard or are doing promotion for the book on your website, please email pictures to content@susancrandall.net so we can feature you on the website! In addition the fine booksellers who have been so kind and and enthusiastic in their support of Whistling Past the Graveyard on the book tour also deserve a great deal of credit and thanks. If you are a reader near any of these bookshops, I highly recommend a visit. It will be well worth your time, and these fine locally owned, independent businesses deserve your support. If you’re a bookseller or library and would like to book an event, please contact Stephanie DeLuca, publicist at Simon & Schuster.